Get a taste of Parisian life just a leisurely stroll from the Best Western Hotel Le Montparnasse. The hotel is near many restaurants, shops and tourist attractions in the 6th arrondissement on Paris' Left Bank. The refurbished hotel couples new design with high-end amenities such as 28 guest rooms with balconies or French balconies with garden and boulevard views, bath rain showers, anti-steam mirrors, mini-bars, easy chairs, and individualized air and heat temperature controls. Business and leisure travelers alike appreciate the indoor-outdoor breakfast room, express checkout, 24-hour front desk, free Wi-Fi throughout and multilingual staff and concierge at their service. 21 miles from the Charles de Gaulle Airport. 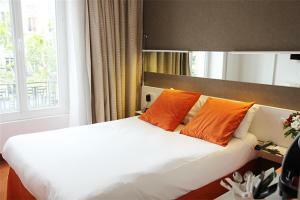 In the 6th arrondissement near the Eiffel Tower and the high-speed train to other famous tourist attractions.